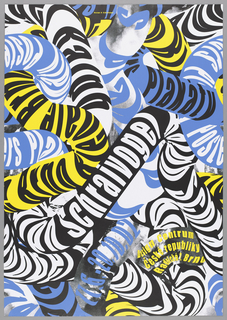 Ralph Schraivogel is internationally acknowledged as one of the most important and influential contemporary poster designers, and certainly the most significant contemporary Swiss designer. The graphic designer Keith Godard said of Schraivogel, “The phonetic translation of his name (screaming bird) is a fitting analogy: his posters are always ‘in your face,’ never using quiet or orderly typography so often equated with the Swiss.” This statement sums up where and how Schraivogel has positioned himself in relation to the expected rational model of Swiss graphic design, which typically incorporates combinations of typography and photography—or typography alone—on a tightly controlled mathematical... more. We have 4 objects that Ralph Schraivogel has been involved with.